Unfortunately there are not any affordable electric cars just yet even with all of the government subsidies. Case in point is the Ford Focus which comes in at $39,995 compared to the gasoline model that is priced at $16,995. Even with government subsidies of say $7000, the price for an electric vehicle of this type is nowhere close to the comparable gasoline model. Even if you get past the purchase price and expect to make it up on gasoline savings, experts have indicated that the price of gas has to go up to at least $6 per gallon which is a very hefty price from recent prices such as $3.50 per gallon in the US. In other countries, where gas is a lot more expensive, the push to electric vehicles may be moving faster, but not in the US or Canada. The car companies are trying to position themselves to be in a position to mass produce electric cars when the big conversion comes, but right now they are still focused on producing cars that are very affordable for the average consumer. In addition there is a lot of pressure on car companies to make their gas guzzling cars more fuel efficient which makes it even tougher for the electric vehicles to compete. 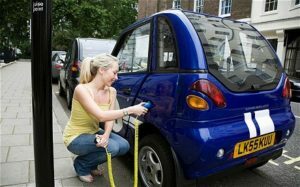 It is going to take either a significant increase in the cost of gas to move this forward or the car companies to mass produce their electric cars to really get the conversion of the public going towards electric cars. The number of cars sold that either use a hybrid technique or all electric is growing. Between January and May of this year, 32,705 cars have been sold. This can be compared to only 14,226 last year for the same time period. If gas prices surge, this will increase the trend. It will also help the needed installation of infrastructure to charge these cars that depend on batteries only. This is a push pull kind of situation. Gas must go up to drive electric vehicles. The sales of electric vehicles must go up to drive down prices which in turn will make them more attractive. In addition the construction of charging stations and the general availability of locations to charge these vehicles will increase. They will figure out the business case once there is more demand for charging of electric vehicles. It will be a few more years before we really see a general increase, but make no mistake it is coming. California is leading the way. This will be the first state to really prepare and drive the manufacture of electric cars into the consumer marketplace. For me right now, the Toyota hybrid is the way to go. You really have the best of both worlds. There is no need to be concerned about charging stations! Even these cars will be interim technology solutions. Once the auto makers solve the battery issue of longevity and charging, electric vehicles will take off in sales. Demand for them will increase dramatically. It is going to be a few years yet before this happens.